Chamomile is a perennial plant, rising 8–12 inches above the ground, with a sweet fragrance, and can be found in cultivated grounds and around gardens. According to Iranian traditional medicine, chamomile has a dry temperament and is a bitter tonic. Claudius Galenus, the prominent Greek physician, used chamomile to cure fever and periodic spasms. 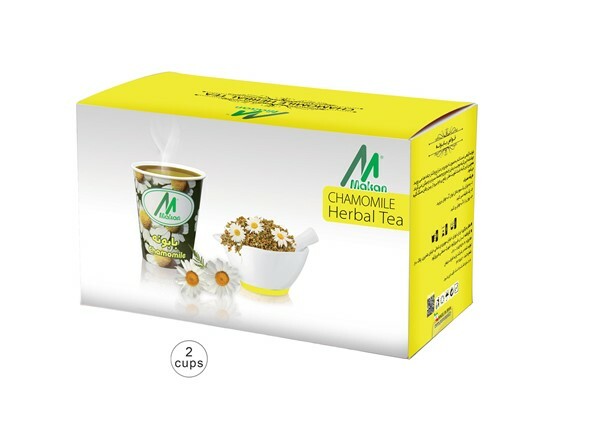 Among most important benefits of Chamomile are treatment of stomach ulcer and gastritis. Chamomile tea can boost the immune system and eradicate infectious cold viruses. Also, it can help with muscle cramps, stomach ache, backache, and menstrual cramps. Chamomile helps the liver function, and the treatment of Rheumatism. Chamomile tea is a powerful sedative that can help you with headache, migraine, toothache, and neuralgia. A new genius idea is to fix Chamomile pods in the bottom of paper cups, making it possible to prepare a delicious and healthy herbal tea in just a minute. These environment-friendly flavored tea cups are recyclable, and can save up time and energy.